This brooch is labeled as a sarpech, or "a turban ornament that was worn by significant Hindu and Muslim princes". Made in 1920, it is an Art Deco design with Indian inspiration featuring a curved central shape set with multiple cuts of diamonds in platinum and white gold. 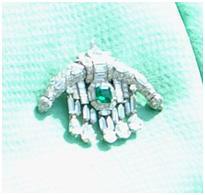 Below, an emerald set with a diamond surround sits between diamond tassels with diamond pendants. The brooch was sold at Christie's* in the Paris Jewels sale in November 2011 for €49,000 ($65,643) and was first publicly worn by the Queen in June 2013, during Royal Ascot. It seems likely it was a gift to the Queen, though a personal purchase is also possible. *Thanks to Lorenzo for sharing this find in the comments, and to Gill for linking to it at the Royal Jewels of the World Message Board!